Obon Interview with Buddhist Priest Elaine Donlin — Nourish Co. When I was growing up, I looked forward to a festival at my Japanese school and local Japanese American Buddhist Church, called Obon. Very simply put, Obon is like the Japanese version of Dia de los Muertos. It’s a time when we celebrate and honor the spirit of our ancestors through dance. What I remember most was the carnival games, amazing Japanese festival food, visiting my bachan (grandma) and her friends from church at the sushi booth, and doing traditional dances with her in the street in my summer kimono on her breaks, to the roaring beat of the taiko drums. The summers I was actually in Japan for Obon, I learned that Obon is not just a one-day festival. It’s an entire season that takes place during the month of July. Many people go to their hometowns to spend time with their families, visit the graves of ancestors and attend the local festivals. I was lucky enough to experience this while I was growing up, though the heat in Japan made it much harder to dance! Then years and years went by and I forgot about Obon for a while. Two years ago, Bryan and I attended the San Jose Obon, which is one of the largest in Northern California. Last year, Bryan and I visited my family and went to the Gardena Buddhist Church Obon at my Japanese school, the largest Obon festival in Southern California. We ran into old friends and ate lots of great food. I kept looking over at the booth my grandmother used to be in, wishing she would appear, but being glad that I could honor her by coming home for Obon. This year, we’ll be in San Francisco for Obon. It will be our first time attending Obon at the Buddhist Church of San Francisco, and I’m looking forward to dressing up in summer kimono and dancing in the streets. I recently had the opportunity to attend a Pride service at the Church and was blown away by how at home I felt. While I am very proudly Jewish, I think there’s room to also attend Buddhist festivals and services. Because I believe when you peel back all the institutional layers, all religions are rooted in love and compassion- we’re not as different as we’d like to think. My Mom is Catholic, and so my parents sent me to Catholic school, which I'm so grateful for because I got an amazing education. I was kind of a hoodlum and so that structure was really good for me. But I was gay from a very early age and going to church was really harmful. When I turned 17 I told my Mom I couldn't do it anymore. I tease my Mom that she deprived me of a really dramatic coming out story because she was just so open-hearted and just wanted her kids to be happy. So I had this really unique upbringing; especially if you think back to how different it was 50 years ago. I really give my Mom a lot of credit. She was just living Jesus's word: The gospel of loving everybody, of not judging. So by the time I was 17, not only was I queer and tired of hearing that I was going to go to hell, but I also didn't see any female ministers. When I left Catholicism, my Mom pretty much just said, “Find something that will ground you, something that gives you spiritual support.” Of course at that age I didn’t. I was just crazy and wild for a while. It wasn’t until I was in college that I took a comparative religion course and found Buddhism. There’s no dogma or doctrine around homosexuality in Buddhism. It felt like I had come home. I practiced Zen Buddhism for about five years and that didn't really work out. It was all so new and I didn’t really have a formal teacher. Then I practiced Tibet Buddhism for 15 years and Tibetan Buddhism. I loved it so much, but that didn’t work for me either. From the time I was 19 until five years ago, I worked for UPS where I did environmental health and safety work. About 20 years ago, I attended a memorial service here at Buddhist Church of San Francisco for a work colleague who had passed away. Her memorial was the most glorious, joyful celebratory service I had ever been to and the resident minister at the time, Reverend Abiko, had given the sermon and it just blew my mind. It was just so open hearted and beautiful, I thought, “I've got to check this place out” so I came back the next Sunday and basically never left. I credit Abiko Sensei for kind of fostering and nurturing the love of ministry that I didn't even know I had in me. And he's the one who really nurtured me on my path to ordination. We think of Buddhism as a great big tree, and at the trunk of the tree are the teachings of the historical Buddha, Siddhartha, who lived almost 3,000 years ago. Those teachings are the four noble truths, eightfold paths, impermanence, interconnectedness, and the idea of no self. That’s the trunk, the fundamental teachings, and then there are three major branches: Theravada, Mahayana and Vajrayana. These three major branches have hundreds of schools off of those branches and they all practice different things. Everywhere Buddhism went, it impacted the culture and the culture it impacted it. So we have this really full, beautiful tree of different schools and sects of Buddhism, but fundamentally we all practice the trunk of the tree. So my tradition, Jodo Shinshu is in the middle branch off of Mahayana. Like all other sects, we believe that that we’re all profoundly interconnected, that all phenomena is rooted in impermanence and the combination of those two is what gives meaning to our life. The idea of no self is really a profound understanding of interconnectedness that, who I was 10 minutes ago, for example, is not the same person I am now because I'm meeting you and having this discussion with you. The Buddha was so radical because the idea of a permanent self was dominant at the time with Brahmanism and Jainism, the prominent religion at the time in India. He said: “No, we have Buddha nature. We all have an inherent goodness," an ability to become enlightened, and so he invited people from the lowest caste to the highest caste to enter his order. Now that you know about the three major branches of Buddhism, I would argue that there is a fourth branch. That fourth branch is American Buddhism. All of the branches I mentioned earlier have historically been predominantly sectarian: You were either raised in a tradition, or you converted to a tradition. American Buddhism is really unique because for example, I find my home in Jodo Shinshu but I can attend teachings from other traditions. Here in the US, we’re starting to become more interfaith within our Buddhist community. The Internet allows people to go online and get these amazing teachings from a range of many wonderful Buddhist teachers. To me, that is SO radically different and it’s not just me; I've had temple members who flew to L.A. to hear a renowned Buddhist teacher from a different sect speak. We have temple members who will go to Berkeley when his Holiness the Dalai Lama is here. No. I would say that it’s our biggest cultural event. Our biggest spiritual event is the memorial of our founder, Shinran, called Ho-Onko on January 16th, so the service is on the Sunday that falls close to that. There’s also Bodhi Day, the awakening of the historical Buddha, which is the first Friday in December. We have a really beautiful service where we line our stupa with tea lights. Probably the largest religious festival is Hanamatsuri, the flower festival, which is the first week in April. Hanamatsuri celebrates the birth of the baby Buddah. It’s always been really big in all of our temples. As the scriptures say, when the Buddha was born, flowers and sweet tea rained from the heavens and when he took his first steps, the lotus flower manifested under his feet. There is a lot of beautiful imagery and symbolism; that's really one of our biggest services. Obon has its roots in the Ullambana Sutra. Ullambana is Sanskrit- transliterated into Chinese letters, is Urabon. “Ura” means to hang upside down and symbolizes suffering. “Bon” means bowl, which symbolizes salvation or liberation. So Urabon means to be saved from the illusions of pain, sorrow and death. The story goes that Mahamaudgalyayana, one of Siddhartha’s disciples, had a dream in which he saw his mother being banished to the land of the Prettas (hungry ghosts). He was so distraught and upset that he went to the Buddha and said, “You know my mom was the most generous person to me. I don't understand why she's a hungry ghost.” And the Buddha said to him, “It’s because she spent all that time giving to you at the expense of everybody. She wasn't generous to anyone other than you.” And so Mahamaudgalyayana said, “What can I do to get her out of this place?” One of our teachings is that the antidote to greed is generosity, so the Buddha recommended that he practice generosity with the monastics in his order who were just coming out of a summer retreat. Mahamaudgalyayana threw them a big celebration with a big, generous, and elaborate meal. Later, he had another dream and saw his mom leaving the land of the hungry ghosts, and so he danced for joy. That’s where Obon odori (dance) came from; we traditionally call Obon the gathering of joy. 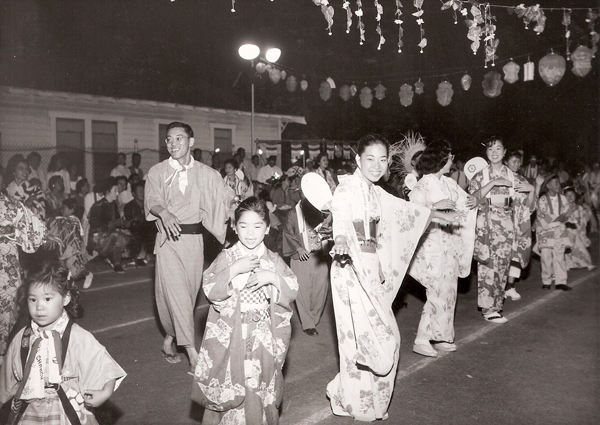 An Obon festival in Los Angeles in the 1950's. Photo via. From what I've read it looks like Obon came from China. Obon wasn't celebrated in India. In the early days, it was just another sutra or teaching for us to understand. In our tradition, Jodo Shinshu, Obon traveled from China to Korea, then to Japan. Remember that everywhere Buddhism went, it impacted the culture and the culture impacted it? In Japan you had Shintoism, and so Obon in Japan is very heavy on ancestor worship. It’s a three-day, sometimes week-long celebration. On the first day they put out the ancestor they are remembering’s favorite foods. During that time, you go to clean the grave and do other things in their honor. And then at the end of Obon, you help send them back to death realm with lanterns that are lit. The first record of when Obon was brought from Japan here by Japanese immigrants was in 1905 in Hawaii. Here on the mainland United States, it looks it came to our Buddhist temples in the late 1920’s or early 1930’s. Obon was continued, although very modestly during the 1930’s and 1940’s because of the war. From what I’ve read, Obon was mostly held in gymnasiums because there was considerable discrimination against Asian (both Chinese and Japanese) immigrants. That’s why our temple looks the way it looks; the architect didn’t want to call attention to the fact that it was a house of worship for Japanese Americans because of the discrimination they were facing. Not every camp had Obon, but every camp had a makeshift Buddhist temple. It obviously wasn’t as elaborate because they didn’t have access to many things, but it was observed in quite a few of the camps. Original WRA caption: Granada Relocation Center, Amache, Colorado. Although music for the Bon Odori held August 14, was furnished by phonograph records and a loud speaker, it was supplemented by the two drummers shown. They are, left to right, Koshiro Kumagai and Jutaro Gondo. The Bon Odori was sponsored by the Granada Buddhist Church. August 14, 1943. Courtesy of the National Archives and Records Administration. Photo via. To me, Obon is a time to remember our ancestors, and it’s also remembrance of our profound interconnectedness: I’m here because of people who came before me. My Dad passed two years ago and so I love seeing my Dad’s lantern every Obon hanging in the entry of our temple. It just makes me feel so connected to him. As a fundraiser, our temple sells the lanterns and attaches the name of the person you are remembering to it. When you come to Obon, you’ll see all the lanterns strung up here and it’s really beautiful. It’s an opportunity for us to remember even deeper and to offer up our gratitude because I wouldn’t be here if it wasn’t for my Dad, or for all the people who founded this temple, for that matter. I have a butsudan (home altar) in my living room. In theory, we go before our butsudan first thing in the morning and say Namu Amida Butsu (a gratitude blessing) or make a food offering. And we do the same thing before we go to sleep and hopefully throughout the day. So my Dad is constantly in my prayers. My butsudan is really not a traditional butsudan I’m really encouraging people to create their own. Who says what’s a butsudan is and what it isn't? Again, that’s the institution, but I think what’s more important is if it’s relevant and meaningful to you. Growing up Catholic, I have a huge problem with anthropomorphizing Amida Buddha. So I don’t have a statue of Buddha in my butusdan. Instead I have a myogo (a scroll that says Namo Amida Butsu), meaning “I take refuge in immeasurable wisdom and compassion.” I think it’s really important to have a sacred space to remember and acknowledge the gifts we receive in life. I love seeing the young people and kids get out there and dance. Bon dance is really about shedding the ego, and connecting with why we're here, the people responsible for us being here, the joy of being able to be with the people we love, family and friends. I am always struck when I see teenage and college-age people out there dancing. They’re not self-conscious at all, they are just having fun- you just don’t see that a lot in the rest of the year. For these kids this is the one time where they can come out and just be open hearted and dance without any self-consciousness. And so I look for that every year- the little kids, the teenagers, the bachans (grandmas) and grandpas. I think it's so beautiful every year. I’m Mexican and Hungarian- I don’t have a stitch of Japanese in me, but I can still appreciate the ritual and the symbolism of what we’re all doing together. Attend an Obon service. The Buddhist Church of San Francisco’s Obon service is on Sunday, July 15th at 10am and will be followed by a somen noodle lunch in the social hall. Attend Ginza Bazaar, the Buddhist Church of San Francisco’s annual Obon festival on Saturday, July 21-22nd. The Bon Odori will start with a procession from the back of the church at Pine and Austin Streets at 1pm on Sunday the 22nd. If you’d like to participate in the Bon Odori, there are dance classes Monday-Wednesday leading up to Obon in the gym at the Buddhist Church of San Francisco from 6pm-8pm. Here is their event calendar. Sakura Sakura in the Japantown mall sells summer kimono, called yukata, if you’d like to get dressed up. You can purchase kachi kachi (clackers) and fans, props for the dances, at Neat Asian Things. If you don’t live in San Francisco, there are more than 20 Obon festivals happening around the country in a 6 week period. Check out this map to find one near you!